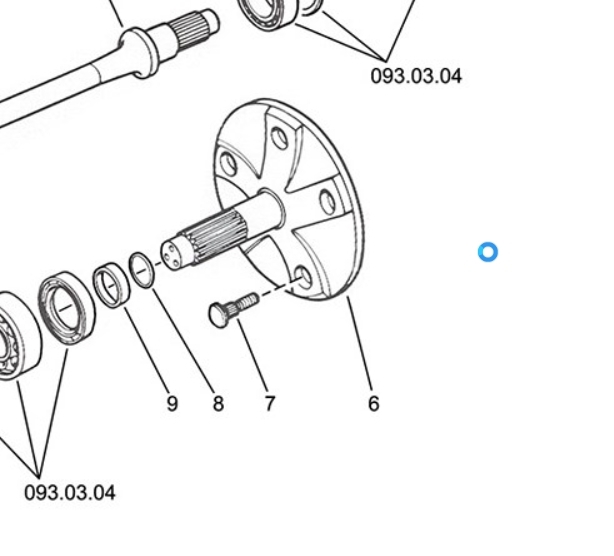 My latest project - Disc Brakes for a 710/712 - Page 3 - THE PORTAL HUB - Pinzgauers, Haflingers, Volvo 303s and more! Haf-e wrote: I did some estimation for the cost of just the raw metal brackets, required mounting hardware and the custom disc rotors - the purchaser would need to provide all of the calipers, plumbing parts and adapters as well as any wheel spacer / adapter required depending on what wheels are used. The cost would be the same for a front or rear axle this way - it uses all the same parts - just one caliper on the rear versus dual calipers on the front. Can you please create a list of the components required for a conversion. You have listed the parts you fabricate, but in order to see the whole project I need to know part numbers for calipers, brake pads, disks, pipes, valves, and where to get them from. Technically that may be part of the kit that is for sale? I've found a Ford transit owner to "borrow" a spare from and hopefully will be able to try it tonight or tomorrow. That will give the answer on the amount of offset required. I am pretty sure it will be about the same as the sprinter wheels. On the vendors - I made up a list and its at 12 different companies to get all the required bits - hence the idea of offering it as a kit except for the wilwood items which are easy to source. I will post up the results of my test fitting here as soon as I get it done. Hotzenplotz wrote: Can you please create a list of the components required for a conversion. You have listed the parts you fabricate, but in order to see the whole project I need to know part numbers for calipers, brake pads, disks, pipes, valves, and where to get them from. Since you are in Europe, is there issues there with the use of bolted on spacers between the disk and the wheel? Its possible to incorporate this spacer into the disk but them longer wheel studs will be required - would that be an issue there? Being in Europe does not put all Pinzgauers under the same umbrella. Germany has different rules than Austria. We just need an engineering certificate fro an approved civil engineer, and things get possible. The Calipers, pads and proportioning valve are all from Wilwood. Best deal on these are from Ebay in my experience. The pads are not the normal ones supplied with these calipers but a thicker version (which is how it was done on the TD Pinzgauers as well). This is also the largest cost item for the conversion - about $400 per axle. The disc/rotors are custom made based on a design I came up with. They have the same diameter and thickness as the TD Pinzgauers. That should help with getting an engineer to sign the design off. These are made by a racing brake company which happened to have the right "blank" casting and was willing to work with me for the low volume. I still need to get a price in various quantities from them. Past discussions suggested not that much price reduction was possible. I know they don't want to deal with lots of people calling them but they could create a part number for the design which would make ordering them easier. These are about $250 per axle (two discs) but might end up less. The mounting brackets are also custom made and are water jet cut from high strength A572 steel. I would probably have them zinc plated rather than powdercoated but could also provide them "raw" to allow the installer to decide. I used a local company to have these made and higher volume would reduce the costs. These require quality control and inspection of each batch made - so they should be made in volume to reduce these costs and to ensure quality. The plumbing is the real challenge - requires a number of adapters and custom lines - both hard and flex are used. This is where the 10 different vendors were involved. One idea is to not provide all of these parts and just give an example list and let the installer do it differently if desired - I am sure they are different ideas on how to do it... It also seems like this is where the liability might occur and leaving this to the installer would allow development of better, simpler, cheaper ways to connect them up - my approach is fine but is just one approach and I was just trying to get it done and not necessarily do it at the cheapest price. The last item is a spacer or wheel adapter - this depends on what wheels are used - but I think standardizing the design on the Ford Transit wheels makes the most sense as they are easier to get than the 5 lug Sprinter wheels (which have not be used since 2006) and only require a spacer and not an adapter (same 5x160 bolt pattern). Other adapters can always be made up by various custom adapter companies. Having these made in batches of 20 to 50 at a time (5 to 10 trucks) will reduce the price significantly I am told. Currently they cost about $160 to $200 per axle when ordered one truck at a time. English is not my native language, so let's iron out possible misunderstandings. You write "disk/rotor". I was under the impression the brake disks are also from wilwood. What do you mean by "rotor"
item 6 on this pic is the wheel flange.Do you mean that ? Brake disk - brake rotor are the same thing and the term can be used interchangably. The term rotor comes the fact that it rotates with the wheel. For Switzerland I would say possible with the right person submitting to the correct authority in the right canton (state) with stars aligned exactly right... otherwise a recipe for failure, at least in my experience. But this begs the question: how different are the US transit wheels compared to the European transit wheels (very interested in that as I have 5 of them on my 710M right now...). Happy to re-post the Ford reference numbers stickers which I kept religiously but their picture on the forum probably disappeared (or are going to) thanks to the Photobucket mess. Happy to measure on the actual rims as per your previous post, too. If they fit, it will always be cheaper to buy them from a Ford dealer in Europe than to import from the USA. I use the same rims, and I have fond memories of going over Google search results in my quest for "Flachbundradmuttern" ("flat-based wheel nuts") in the correct dimension and thread. Do you know if either these or the new transit rims could accommodate the disc brake conversion? Hotzenplotz wrote: item 6 on this pic is the wheel flange.Do you mean that ? 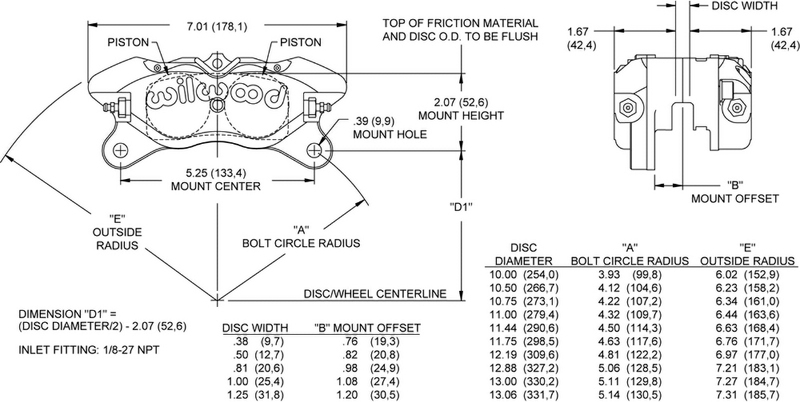 Yes - Item #6 is the wheel flange. The brake disk / brake rotor (same thing) is FLAT with a thickness of 13 mm. 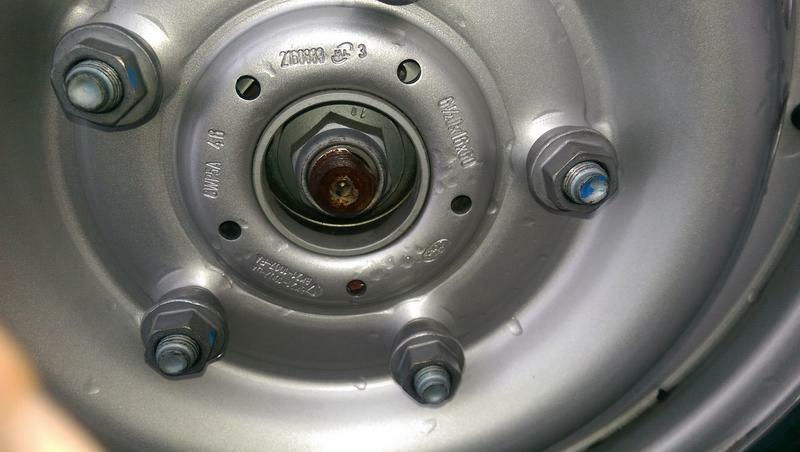 It attaches to the flange using the original 5 lug bolts. The disc is not from Wilwood but is custom made for the conversion. I'll try to pull the disc off to take some photos but it will be a week or so. Since the caliper protrudes outward from the disc 1.67" (42.4 mm), a spacer needs to be placed between the disc and the wheel. The thickness of this spacer depends on the space available inside of the wheel for the caliper to fit into the "pocket" inside of the wheel. With the sprinter wheel, the pocket is marginal - but it has an ET 75 so this allowed a thicker spacer without causing the wheel to be moved outward too much. The Transit wheels I've seen have an ET of 60 which means they already start further outward compared to the sprinter wheels. They appear to have a different shaped pocket which may not require as thick of a spacer. The critical dimension is the inner diameter of the wheel - typically where the welds are that attach the center of the wheel to the outer "shell" or "rim" of the wheel. It needs to have at least 13.5 inches as a minimum - the total diameter of the brakes is 13.4 inches. The next dimension relates to the space between the outer edge of the caliper and the wheel at the outer edge of the caliper - so at a distance of 6.75 inches from the center of the wheel. Since the calipers are curved, this is tricky to estimate exactly without actually trying a wheel. Wilwood advises at least 2 mm between the wheel and the caliper for clearance. 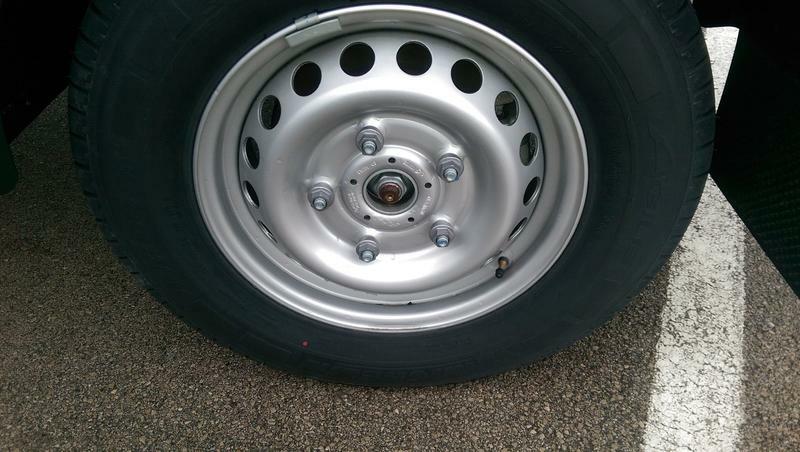 Depending on the thickness of the spacer, there may be the need for longer lug bolts / studs. Last edited by Haf-e on Wed Aug 09, 2017 9:00 am, edited 2 times in total. All conversions I have found until now require new wheel flanges. They are smaller in diameter in order to create space for the disks. Staying with 5 x 160 I cannot imagine how to mount the disk on that flange, that's why I asked for the details. You replied while I was typing. So the bespoke disk is mounted on the flange the same way as the brake drum. 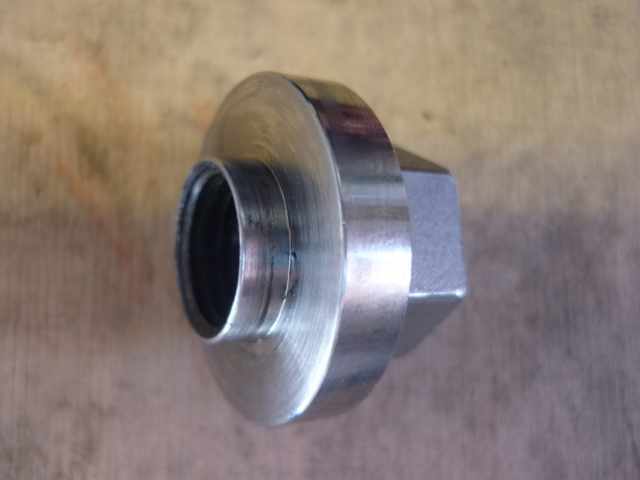 The spacer dis you use is to compensate the ET offset and to convert the bolt pattern. Yes - the wheel flange (Item #6) is not modified. The custom disc has just enough room for the friction surface to work as long as the wheel has a larger inner diameter than the original stock wheels. The key is the disc being flat and not having a "hat" shaped profile like a typical brake disc. The flat shape also provides enough room for the caliper behind the disc to not require modification of the aluminum casting which serves as the backing plate of the drum brakes. No machining of the stock Pinzgauer parts was the goal. There are a lot of small details to the exact shape and dimensions of the brake disc which I have not detailed here as it is quite complex to explain without detailed drawings - but the bottom line is I got it to fit with the 16 inch Sprinter wheels. Hopefully, it will work in the USA transit wheel and probably in the European transit wheels as well - and probably will use a thinner, cheaper spacer instead of the more expensive "adapter/spacer" I used for the transit wheel. 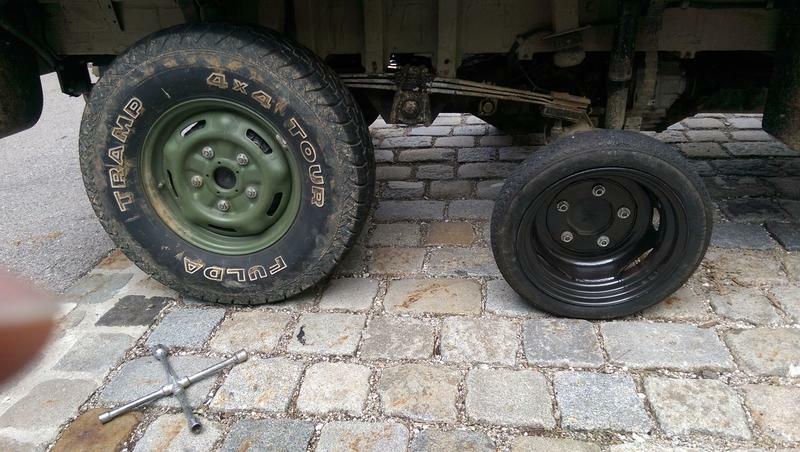 Longer lug bolts may be required though. Its worth noting that Sprinters in Europe come typically with 15 inch wheels - so that isn't probably a good option in Europe then. G-wagen steel wheels or the real TD Pinz steel wheels would be the best option there - they have a bulge in the outer section of the wheel center to give extra clearance for the caliper. But, since they are 5x130, they would require a wheel adapter to be used.